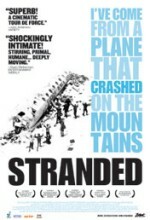 The overdue documentary response to Frank Marshall's 1993 drama, Alive, Stranded conveys with profound respect and tremendous upwellings of emotion the story of the Andes flight disaster. It's a survival tale seemingly so familiar that the human power that underlies is often forgotten. Director Gonzalo Arijon seeks to rectify this with a stirring, sublime film that focuses on the first-hand experience of the sixteen survivors. Emulating Errol Morris with stylized recreations and an absence of narration, Arijon allows the survivors to convey the story of the crash and the ordeal that followed, dwelling not only on the grisly choices they made, but also on the sheer uncanniness of their situation. The survivors recall the details of their trial with stunning clarity, and Arijon delicately frames their meticulous remembrances and their sobering meditations on life and death. Time and again, the men profiled in Stranded return to the notion that the world in the Andes was a New World, different from the world of family, friends, and comfort they left behind. Exhibiting a mysterious blend of pain and ecstasy, they speak of sacrifice, death, and resurrection with the authority of saints. What a powerful film.